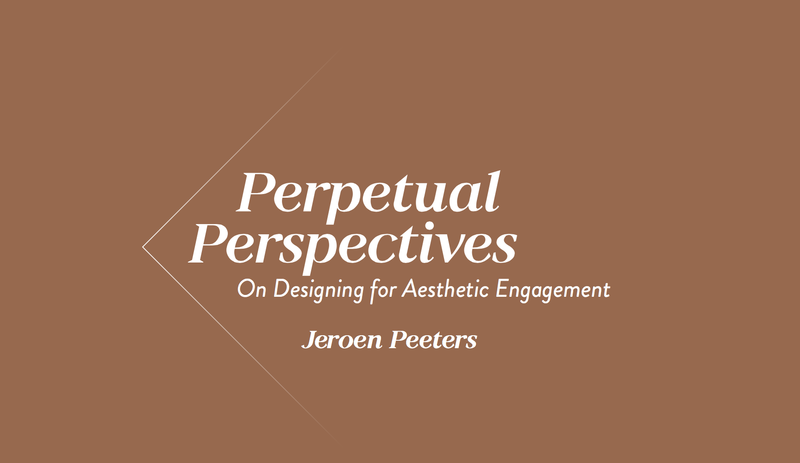 On January 25th 2017, Jeroen Peeters has defended his PhD thesis “Perpetual Perspectives. On Designing for Aesthetic Engagement”. The thesis has been supervised by Anna Croon and co-supervised by Ambra Trotto. The defense has been opposed by John Zimmerman, Human Computer Interaction Institute, Carnegie Mellon University. “This dissertation investigates aesthetics of engagement in interaction. Aesthetic refers to the aesthetic experience, based on a phenomenological and pragmatist understanding: dynamic and personal, appealing mutually to – and formed inseparably by – our bodily, emotional, as well as intellectual faculties. Engagement signifies this experience as forming a deeply involved relationship between people and an artefact in interaction. The findings of this research form two contributions to the overlapping fields of Human-Computer Interaction and (Interaction) Design Research. The main contribution is methodological and is concerned with generating knowledge through design. The methodological structure of this dissertation builds on a programmatic approach that centres on the first-person perspective of the designer, who learns from experience by reflecting on design action. This dissertation contributes to this discussion around designerly ways of knowing by exposing how skillful coping and intuition, through mechanisms of reflection-on-action, generate a multitude of perspectives on a complex design space. Exposing and consolidating the first-person (design) knowledge embedded in these perspectives allows this knowledge to be articulated as a shareable academic knowledge contribution.